Many times I take a photo, edit it, and it just isn’t giving me a wow factor. I can tell it looks promising but it just needs something MORE. Let’s look at these four examples and see why the black and white conversion made them stronger, more interesting photos. In this first image, the girl is looking down and away, almost solemn. By converting this to B&W, I was able to rid the distractions, emphasize her face, and use the shadows to create a calm, soothing image. Muting the blacks with a matte effect also enhanced the mood I was looking for. This next picture of my son looks pretty good in color. What I love about converting this one to black and white is that it gives it a more timeless feel. This image could have been taken today, or 20 years ago. I also think that instead of his skin and hair blending with all that yellow/orange background, I was able to make him stand out more in B&W. The lens flare being more prominent is just a little icing on the cake. For this next set, I actually shot it thinking how great it would look in B&W. I think I was right. The architecture, the texture, the shadows, and the light in the hair – it all just comes together as a strong black and white success story. This image has a lot of contrast; that is a key point to finding a photo that will work well as a black and white image. This last one may be one of my favorite black and white images I have ever shot. It was shot on the beach, just before sunset on a very over cast day. 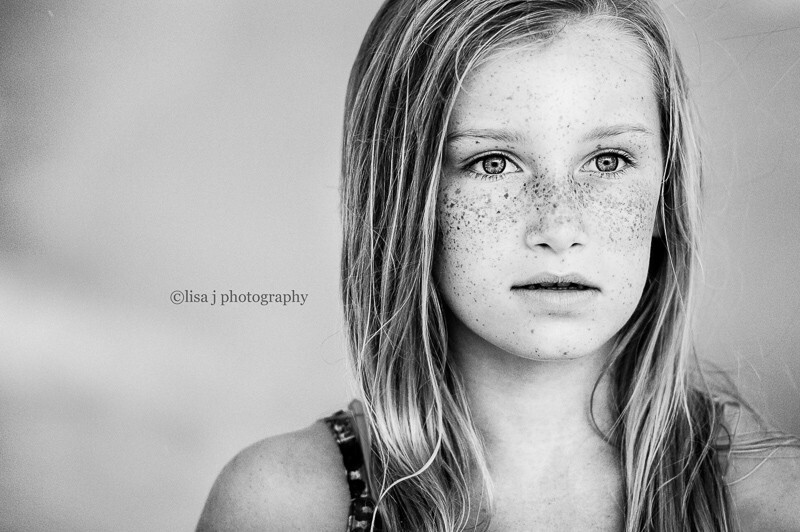 The girl is just striking, and her eyes and freckles are captivating. For that reason, I almost didn’t even try a conversion, thinking her coloring was her strong suit. But thankfully I did, and I played up her freckles and the highlights in her hair – those contrasts were enough for a winning combination. So remember, if you want to add a little mood, interest, or oomph, to an image; take a minute, and try black and white conversion. I recommend doing your regular edit first, and then do a simple black and white conversion to see if it seems like you should explore and tweak it further. I bet you will find some new GEMS!!!! Hi, I’m Lisa. I am a wife to an awesome man. I am a mother to two rambunctious boys. I'm lucky to call the panhandle of Florida home, with sandy white beaches and turquoise water oh so close. I love sunshine, chocolate, and wine... oh and of course photography. I have had a photography business, Lisa J Photography, for seven years focusing on family and children. You can see more of Lisa’s work on her Website or Facebook. Good article. Thanks! Love your conversions on all of these, Lisa! Super article, the comparisons really drive the point home. I was curious about the picture at the top of the article, I always struggle to capture droplets, rain, etc… was it lit from the side? Hi Jean – that shot was when a break of light came peeking through the clouds…also the droplets are exaggerated because he is bumping them up by opening the umbrella.